EUROPEAN JITTERS AT WORK AGAIN – 30/04/2010. April was a dull month as far as our markets were concerned as the indices were struck in a small range for the whole of past month. The Nifty continued to trade in a small range from 5160 to 5399 throughout the previous month. A breakout continues to elude us, as the market will now focus its attention on monsoon besides the global markets. The monsoon is likely to be very near to the normal and the met dept. expects the monsoon to set in early this year, which will be quite a relief in this soaring temperatures. Last week was dominated by the PIIGS as the European countries continued to experience jitters and which made global markets tremble as there was a rising fear that the Greek debt crisis could worsen as Germany continued to hold strict conditions on the aid package offered to Greece. Investors and traders started targeting Portugal, Ireland, and Spain in order to find out the next weak link in Europe. As the global markets are getting more and more interlinked, our markets will certainly not be spared. But that will not negate the long term growth prospects of our economy. So any knee jerk reaction due to global market sell-off will provide a good entry point in our market for all those sitting on the sidelines, from a long term point of view. Most of the major results are out of the way and hence the focus will shift on the RiL-RNRL court verdict which is expected next week. RNRL has very little to lose even if the decision is slightly tilted in RiL’s favour. Thus it is not very surprising to see the kind of movement seen in the RNRL stock during the past week. 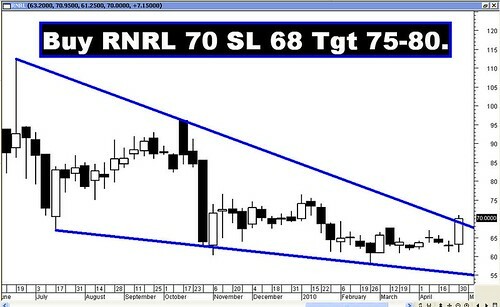 Interestingly RNRL is moving up towards its 200dma which falls at 73 and at the same time RiL has moved lower than its 200dma. Is it the sign of things to come? Next week will have the answer. The Sensex opened the week at 17692, made a high of 17826, a low of 17344 and closed the week at 17558. The Sensex lost 136 points on a weekly basis. 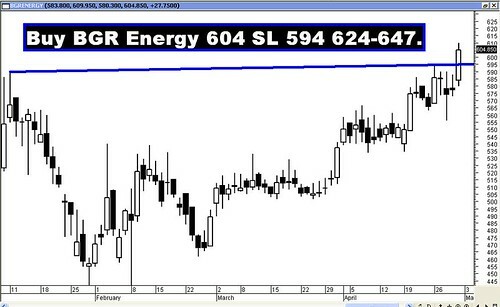 Similarly Nifty opened the week at 5299, made a high of 5342, a low of 5202 and closed the week at 5278. The Nifty too closed with the week with a loss of 26 points. Both the indices have formed a neutral spinning top like formation on the weekly charts. The weekly candle has a small black body with a long lower shadow as compared to the small upper shadow. The long lower shadow is indicative of the buying pressure from lower levels. Both Sensex and Nifty bounced this week (Sensex - 17344 and Nifty – 5202) without breaching the previous weeks low (Sensex – 17276 and Nifty – 5160). Oscillators like the ROC and the MACD continue to be in Sell mode, but the MACD is still in positive territory and the ROC is nearing the zero line. OBV has just given a buy signal and one needs to consider this as an advance signal. MFI and RSI have both started moving higher. The Directional Indicators are in a Sell mode but are converging towards each other. The ADX is slowing down at 22, which is a sign of trend deteriorating. Both Sensex and Nifty bounced this week from 17344 and 5202 without breaching the previous week’s low of 17276 on the Sensex and 5160 on the Nifty. This level coincides with the 50dma (Sensex – 17271 and Nifty – 5170). Hence the short term direction of the indices will be up as long as the immediate bottom of 17276-Sensex and 5160-Nifty is held. If these levels are broken, the indices will re-enter short term correction. Sensex has Trendline Resistance at 18223 and Trendline Support at 17239, while Nifty has strong Trendline Resistance at 5424 and Trendline Support at 5145. Nifty OI PCR is quite steady at 1.31. Call writing is visible at the strikes from 5400 to 5700 but lot of open interest has been added to the strike of 5400 which will provide strong resistance on the way up. Put writing is seen from the strikes of 5200 to 4800 but lot of open interest has been build up at 5200 strike price, which should provide support in case of a fall. Option players can create short strangle between the strikes of 5100 and 5400 by selling 5100PE and selling 5400CE. One can earn if the Nifty stays within the above mentioned range, then the strategy will gain advantage by eating into the time premium. The risk increases when the Nifty breaches any one side of the trading range. 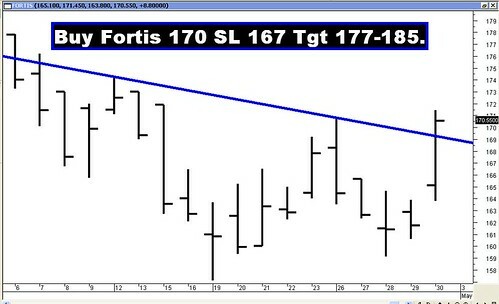 For the week ahead, Sensex will find Support at 17448-17344-17239 and will find Resistance at 17679-17826-18047. For the week ahead, Nifty will find Support at 5222-5187-5145 and will find Resistance at 5310-5342-5399. Last week all our recommendations reached their targets, only JP Associates and MLL missed by a whisker. The star performers were Nagarjuna Construction and Tata Motors.